Either way, we think that spending time with relatives inspires some people to seek out DNA testing. What do taxes have to do with DNA testing? Well, some people who are real go-getters like to complete their taxes early in the season and (hopefully) get their refund back sooner. 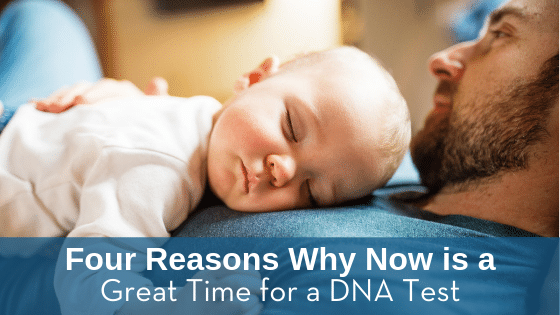 With an influx of cash, it might be time to finally get that DNA testing done and settle the matter of paternity once and for all. Also, if you are claiming a child as a dependent on your taxes but there is a question of paternity, you are legally obligated to pursue DNA testing and sort out the matter. Winter in Kansas City usually means cold temperatures, which means staying inside, which means cabin fever! When you’re stuck indoors thanks to ice, snow, or a plummeting wind chill, you might decide to take up a new (or long-abandoned) project: family tree research. DNA testing can be used to kickstart your research, verify biological relationships, uncover hidden branches of your family tree, and more! For the rest of this month, you can get an ancestral origins test for just $199.00! Visit the SPECIAL OFFERS on our website to learn more. Holidays like Christmas and Valentine’s Day are known for being romantic — and can create a need for DNA testing, particularly paternity testing. We offer an accurate, confidential, and 100% safe pre-birth paternity testing for women who need to solve questions of paternity year-round.